Hi Everyone! So over the last month many of you have been asking for my basic bread recipe. And I must be honest and say, I get it straight out of the Tartine cookbook (incredibly informative and a must-read for any newly obsessed baker! ), with just a few minor adjustments and my own improvisations. What kind of improv are we talking about here? Well, that’s for me to know, and for you to hopefully taste! It changes every time and I think that is a big part of why I love baking so much. It forces me to be present and mindful right then and there, and allows me to take creative risks. It is a lot of fun! I definitely recommend buying a scale, if you don’t have one already, because measuring out ingredients for a loaf (or two) of bread does not bide well in cups. Grams are much more accurate. And trust me, the more bread you make, the more of a chemist or mathematician you will become. Now I understand why some engineers or science teachers quit their jobs and get knee-deep in dough. There are lots of equations involved and once you get it down to a science (which I am working on — slow and steady wins the race), it becomes second nature to you, just like riding a bike or making an omelet. Mmmm, omelets and fresh bread. That’s a Sunday favorite at our house! So, here’s Tartine’s basic recipe for a Country Loaf, as they call it. It yields two loaves, so go ahead and divide the recipe in two if you are planning on just baking one on a particular day. Ok, here is where the chemistry and organizational skill comes into play. 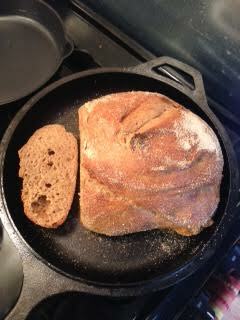 Temperature is key with bread baking. If you want to play by the rules and go pro, I suggest getting a thermometer to measure out temps of your ingredients, particularly the water, in comparison to the ambient room temperature. The hotter the environment, the quicker the bread will ferment; the sooner it will rise. Most breads need a bulk fermentation of about 3-4 hours. I like to slowly ferment my breads (as you know from previous posts), so I ferment mine for up to three days (at room temp initially and then the fridge) to up the nutritional content (longer fermentation equals higher bioavailability of nutrients and lower glycemic index, thus making bread more easily digestible and mega-healthy). 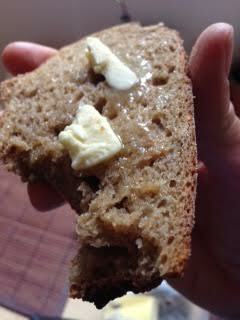 Oh, and it also brings out a more sourdough-like flavor, which is super tasty to me. Place the water in a large plastic bowl (or a circular metal bowl is fine too), and then the leaven and the flour. Mix with your hands until there are no dry bits of flour left in the container. Let the dough rest for 25-40 minutes. This resting time is key because it enables the dough to begin working its magic. I like to compare it to those first few years of childhood, which are oh, so important and set the stage for hopefully a happy and healthy life. After the resting period, add the salt and anything else you wish to add (rosemary, basil, spices, cardamon, cinnamon, raisins, what have you) and fold it into the dough. I have been getting into adding Chinese Herbs to my breads and they are tasting incredible and quite medicinal. You can also add up to 50 grams of warm water here, if the dough seems to dry. I personally have never had to do more than 5 or 10 grams, but that’s all a matter of preference. Don’t get worried if you feel like the salt is not evenly distributed. Somehow it all just magically works out in to the end. Trust the process. And then fold the dough once every thirty minutes for a total of 3 or 4 hours (so approximately 6-8 times) by lifting the dough from the bottom and flipping upwards. If your hands get sticky, just put a little warm water on them. It’s pretty awesome after a few hours, because you can see that the dough has risen a lot and it is even gaseous (in a good way!). A note about the leaven: If you have your starter in the fridge, bring it out about 24 hours before you want to make a loaf. About two hours before you are about to start, pour out about 80% of your starter and feed it 50/50 flour/water. Stir it a bit and let it sit in a cool, shaded place in your kitchen for an hour or two before you start. It should be thick and not watery. If it is, add more flour and stir gently. You will need 200 grams (for the Tartine recipe of 2 loaves). That ends up being a little more than 1 1/2 cups of leaven. Once your bulk rise is complete, then you can either put it in the fridge to ferment longer (Tartine says 8-12 hours, Bread Culture says the longer the better and more sour). Take it out of the fridge and let it sit at room temp about 1 or 2 hours before you want to bake. Most of the pre-shape should be finished already, but if you want it more pristine, you can use a dough spatula to shape it and score it (put a cut in the top, which adds character and allows the loaf to “breath” a bit). Pre-heat the oven to 500 degrees. Get your dutch oven or combo cooker (Amazon.com has one from Lodge for about $40) and place it in the oven for 20 minutes. After the 20 minutes is over, reach in with an oven mitt and take off the top of the cooker. Steam will come flying out of it and this is a great sign! The steam will help create a better environment for the bread to bake to its fullest capacity. Lower the oven temp to 460 degrees. Sprinkle the cooker with Rice flour or Cornmeal, so that your dough won’t stick, and place your dough inside the cooker. Bake for 20 minutes only in the combo cooker, and then take the lid off of the cooker (the loaf will look pale and moist…that’s a good thing!) and bake another 25 minutes or so, until golden brown and crisp. There you have it, friends! I hope it was straight forward. I know there are a lot of steps, but once you attempt it a few times, it just gets easier and easier, better and better, more and more delicious! Please feel free to write or comment if you have any questions!! Here’s a picture of my latest loaf. It is a combination of various flours from Grist & Toll (you can read all about this amazing urban flour mill in a previous post). My fave flour combo has become about 40% Sonora Wheat, 30% Rye, 20% Spelt, and 10% Brown Rice Flour (that I mill myself). Happy Baking! Oh, and I also attached a video of Chad Robertson explaining a few of the steps in the process. Enjoy!